Buying a big, expensive piece of art is something of a rite of passage. Whether you’re graduating from that print of Starry Night you had in college, a hand-me-down painting from gramma or a discount store, or finally moving on from your blank, unadorned wall, having a signature piece of art that you really love is a big step in making your house a home – and in getting an aesthetic you really love. Once you get a piece of art that’s worth building your room around, though, you might need to do a little redecorating to match. Whether the painting you choose is an abstract landscape like this one or really anything up to and including a single solid-colored canvas, the artwork itself is going to give you a palette of colors to work with. If your big-ticket living room items stick to a neutral color scheme (as most do), that means the big opportunity for tying your room together comes in the form of accent pieces. 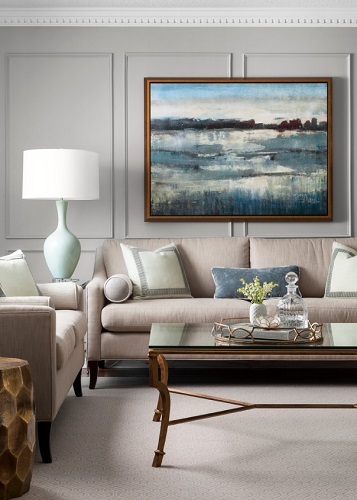 The soft blues, grays, and cream tones in the painting are echoed in the throw pillows and lamp, but in a way that’s subtle enough not to feel forced – just enough to give the space a sense of harmony. What’s especially clever, though, is that the designer also matched the painting’s wood frame almost perfectly to the coffee table and wood garden stool, so the room as a whole has a very relaxed, mellow feel, but the eye is drawn effortlessly between the artwork and accent furniture. Building your decor around a painting (or just updating your look so your new art doesn’t seem out of place) doesn’t have to be hard. While experienced designers with a blank canvas (so to speak) can get creative with matching wall paint, trim, carpet, and so on, for a DIY update it can really be as simple as picking your favorite color in your new favorite painting and finding a throw pillow, a vase, and a lamp that match! This entry was posted in Decorating Ideas and Tips and tagged colorful accents, get the look, Interior Design, living room accessories, living room design, redecorating, wall art.